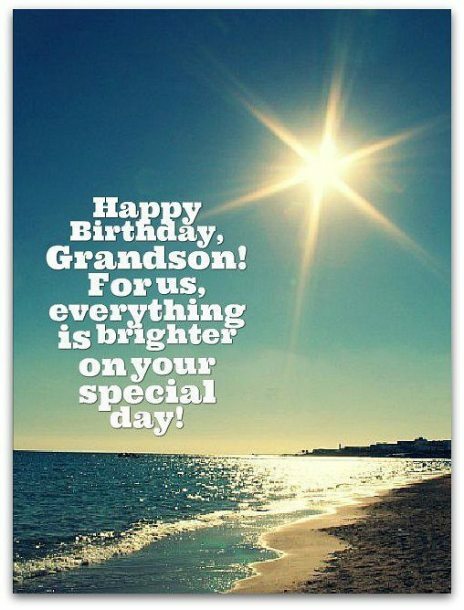 The best grandson birthday wishes are original, cute, clever, heartwarming, happy-go-lucky and moving — all at once — just like your precious grandson and the unique, beautifully birthday messages in this section. Choosing the right grandson birthday message for an eCard, Instagram or Facebook, one that he will cherish long after his special day, can be a little daunting, especially for a teenager or young man. To make it easier for yourself, keep in mind that he may not be too comfortable with an overly affectionate. Instead, think about giving him an inspirational or funny birthday greeting. When it comes to grandson birthday messages, you can take the easy route and underwhelm him or the better route and create a lasting memory. The easy route is the safe way to go. It's the route that leads to choosing what I call "typical" grandson birthday wishes — the type he'll read for a second and discard without a moment's hesitation. Sure, he won't be offended by this kind of birthday wish — that's what makes it safe. But he also won't remember it after a few moments. This, I presume, is not what you want to happen. The better route takes into consideration his age and your type of grandparenting. 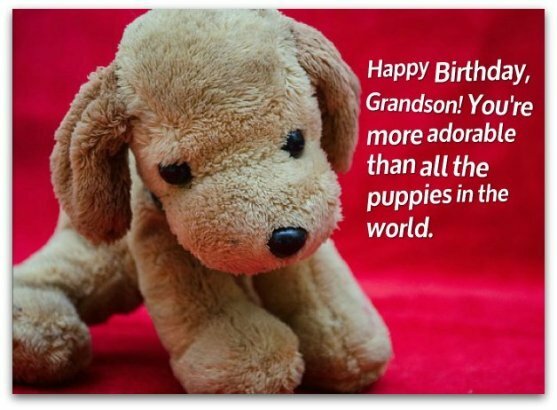 Based on these factors, I will suggest the best kind of grandson birthday wishes you should pick for your grandson — something that he will want to keep forever (whether you put it into a card, on an eCard, on his Facebook page, in a text, wherever). That's what you're aiming for, right? First of all, his age. If he's 13 and under, he will likely care more about his gift than his birthday wish. So, for the young ones, stick to a pleasant, typical, well-written birthday message. I know I mentioned only a few moments ago that this type of birthday greeting is not as good as the alternative but he's going to discard it anyway and make a mad dash for the cash or gift card he want to give him. If your grandson is 14 and up, you can assume that he has the maturity to appreciate great grandson birthday wishes when he sees yhem. If so, this is where your grandparenting style comes into play. The formal grandparent: You follow the standard rules of grandparenting, providing occasional services (not just babysitting) and maintaining an interest in your grandson, but you're not too involved in his life. The fun seeker: You're the fun grandparent — you like to provide entertainment for your grandson. The surrogate parent: You are or were the primary caregiver for your grandson. The patriarch (or matriarch): You not only dispense advice and money — you also "control" the parents of your grandson. The distant figure: You have infrequent contact with your grandson, appearing only on holidays and special occasions. The formal grandparent: Pick so-called "happy" (the term I use for "generic" on my site) birthday wishes. Any other style may make you and your grandson uncomfortable. The surrogate parent: Opt for sentimental birthday messages (you've earned the right to pick a heartwarming birthday greeting). The wise patriarch (or matriarch): Select an inspirational birthday wish. It's the best way to dispense advice. The distant figure: Pick "happy" birthday wishes (anything else would likely be awkward for you and your grandson). You'll find all these styles (and more) in this section, so it should take you only a few minutes to choose the right one from all the grandson birthday wishes here. If your relationship is a mix of the types I mentioned above, what’s the best route? Probably a mix of cute and happy...with a touch of the sentimental (and the right amount of inspiration). In any case, simply start with an option below that best captures your grandparenting style and go from there, adding your personal touch (if necessary). You're a brilliant, shining star, Grandson! I'm so glad you’re in my universe. Happy birthday! What can I say about a grandson that’s so handsome, funny, kind and smart. Hey, wait...I just said it! Happy birthday! Having you as a grandson is a gift from the BIG GUY upstairs. And I'm not talking about your father. Your birth is truly a blessing! Happy birthday! Grandsons like you are so rare. We feel so blessed to have you in our lives. You are our prince, our hero, our light. Happy birthday! My dear grandson, you're the coolest dude I know. You make me young...and cooler than I have a right to be at my age! Happy birthday! Happy birthday! I declare you the winner of the "Best Grandson Ever" Award! There’s something I would never trade for anything…having an amazing grandson like you! Happy birthday! Happy birthday! There's not a single grandson in this world who can come close to your incredibleness. After all, you're related to us! Wishing you get everything you want on your birthday — and we have every intention of making this wish come true for you (no matter what your parents think). I don't hug and kiss you enough, so I decided to include a bunch right here — XOXOXOXO. Of course, there's many more where that came from, if you ever need extra! Happy birthday! Happy birthday! You are exceptionally handsome, smart and talented...I guess you take after me! May you become more like me every day — you know, modest. I feel so honored to be part of your birthday and, most importantly, be part of your life. You make me so proud and happy. Happy birthday, Grandson! Happy birthday, Grandson! I know your special day will be a major hit, just like you! On your birthday, I always want to do the same thing — spend time with you and make sure you have the best birthday ever! Happy birthday to my favorite (and only) grandson! You're a superstar. You're a champion. You're an MVP. Mostly, though, you're an MVG….Most Valuable Grandson! Happy birthday!